Apple is about to present new iPads! New iPads to be revealed on Tuesday! Apple is about to present newly updated goods at the event in San-Francisco that was scheduled for Tuesday, Octobet 22. We are expecting to see some new models of iPad and iPad mini as well as the newer version of Apple tv and MacBook pros Retina, powered up by Intel Haswell processors. As for the iPad part of the presentation – we will see two new models: the original iPad mini (full-sized) and the iPad mini. Analysts predict the new models to be packed with faster processing core chip that will be close to the technology of the one that is installed on the iPhone 5s – the 64bit A7 chip. It is plausible that the models will have slightly redesigned look. 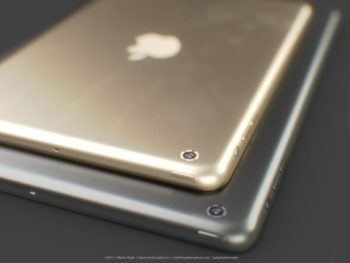 The full-sized iPad is expected to be more like the iPad mini – lighter, thinner, slightly different color scheme. Additionally, some upgrades to front and rear-facing cameras are also to be implemented in the newer versions of the Apple’s tablet computer. Fingerprint ID technology?The analysts were divided onto two parts: some truly believe that new iPad’s will have Touch Id sensor under the hood same as iPhones 5s. But another part does not think that it is going to happen with the release of new models. New color scheme of the iPad’s is also debatable. Ones truly believe to see them in Golden color same as iPhone 5s, but another group of analysts do not expect the new models to be shipped in this color. From the moment of announcement of the original iPad mini model, many have been expecting to see the Retina display implemented in this little beast. However it did not happen. It had the same resolution as the iPad 2 did. Many believe that Apple Is about to change that by introducing Retina displays to the newer iPad mini 2 models. Reuters report that there is a chance of retina display shortage, this might reflect on Apple’s decision on whether introduce Retina iPad mini’s or not. If they decide to stick to the 1024×768 display – it would turn out to be a major disadvantage against new tablets as Amazon Kindle Fire HDX and Google Nexus 7 with their full HD displays. All the doubts and rumors will end with the tomorrow’s presentation! So stay tuned.